Start the Gallery app by choosing its icon from the Apps screen on your Samsung Galaxy tablet, or you may find a shortcut lurking on the Home screen. When the Gallery app opens, you see pictures organized into albums. The number and variety of albums depend on how you synchronize your tablet with your computer, which apps you use for collecting media, and which photo-sharing services you use on the Internet and have synchronized with the tablet. 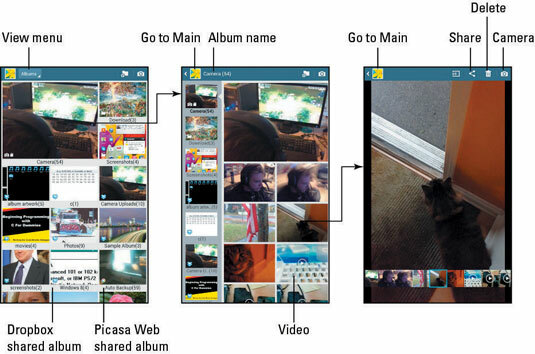 Touch an album to display that album’s contents; the pictures appear in a grid of thumbnail previews. Swipe the screen left and right to peruse them all. Touch an individual thumbnail in the album to view that item full size on the screen. You can rotate the tablet horizontally (or vertically) to see the image in another orientation. Spread your fingers or pinch on the touchscreen to zoom in or out, respectively. Swipe the screen to page through images in an album. If any videos are stored in an album, they appear with a Play button on the screen. Touch that button to play the video. As the video is playing, touch the screen again to see the control to pause the video. You back up from an image or a video to an album by touching the Back icon. Touch the Back icon again to return to the main Gallery screen. The Camera album contains pictures you’ve shot using the tablet’s camera. Albums labeled with special icons, such as the Dropbox and Picasa web icons have been synchronized between your tablet and the Internet. Use the View menu to choose how images appear in the Gallery. Other albums in the Gallery represent images synchronized between the tablet and a computer. Touch an image to see the onscreen controls and other information. If weather and location information is saved with the image, it appears on the screen as well (albeit briefly). To view all the images in an album, touch the Menu button and choose the Slideshow command. Playing a slide show turns your expensive tablet into a less-expensive digital picture frame.